Halloween is this Saturday. Planning on partying? You can get a free and safe ride home thanks to the Washington Regional Alcohol Consortium’s (WRAP) Halloween SoberRide program. SoberRide program will be offered from 10 p.m. Saturday, Oct. 31 until 4 a.m. Sunday, Nov. 1. You must be 21 or older. To receive a free cab ride home (up to a $30.00 fare), please call 800-200-8294 (TAXI). AT&T customers may dial #WRAP from their wireless phones. Riders are responsible for any fare over $30. 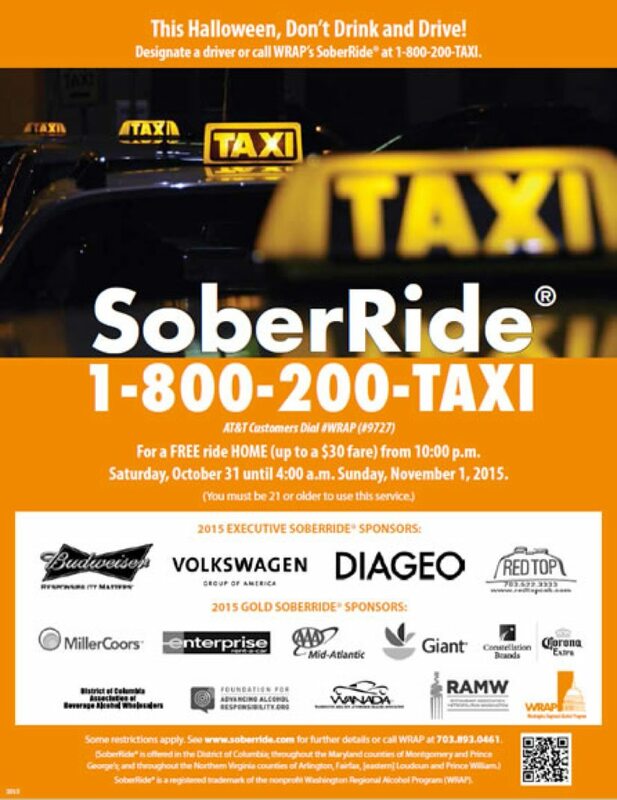 All requests for SoberRide service must be called to and dispatched from 1-800-200-8294. 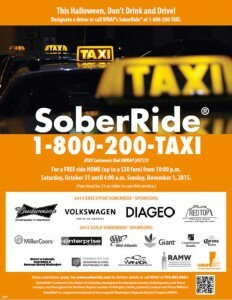 Do not call a taxi company directly for SoberRide service as the ride will not be covered under this program. You cannot reserve a SoberRide or schedule a pickup in advance. To receive a ride, you must call 1-800-200-8294 (TAXI) during the program hours. A SoberRide call operator will direct your request to the correct participating cab company. WRAP’s SoberRide has helped to ensure greater Washington, DC residents have a safe way home on high-risk holidays. Since 1993, WRAP has provided over 62,773 safe rides home on holidays such as St. Patrick’s Day, Cinco de Mayo, December party season/New Year’s, Independence Day and Halloween.